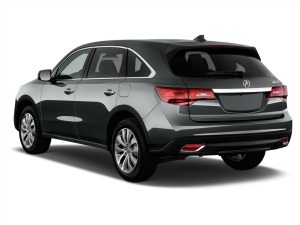 The Acura MDX represents the ideal confluence of luxury, safety, and value. This premier crossover vehicle offers three row seating for seven people, a consistently high rating from its buyers, and an excellent experience for both the driver and passengers. The 2015 version of this SUV is essentially unchanged from the 2014 model, but those looking for more can select options with incredible features including enhanced performance, meticulously classic design, and enhanced interior and exterior features. Regardless of model chosen, this SUV offers ample cargo space, three rows of seats, many safety features, and more. Pricing options are divided into several different trim levels to accommodate as many drivers as possible. Standard features that come with the base model include LED headlights, heated mirrors to prevent ice and reduce fog, heated seats, memory settings for each driver, bluetooth connections for phones and audio, and a luxury sound system that allows for both line-ins and CDs as well as satellite radio. There are also technology add-ons, a technology and entertainment add-on, and an advance and entertainment package. A technology package will add features including surround-sound, a navigation system, solar-sensing climate control, windshield wipers that sense rain, and safety warning to reduce risk of collisions. For those who value in-transit entertainment (or have unruly children who they wish to distract), an entertainment add-on includes a power outlet, heating for all seats, and a nine-inch DVD display for rear seats, among other enhancements. The most advanced trim of the MDX also has an advance/entertainment package. This package adds on all the extra features possible – this includes a roof rack, enhanced collision warnings, a braking feature that will brake automatically to avoid collisions, an HDMI input, and various other upgrades. Pricing increases as further additions are made to the base model. 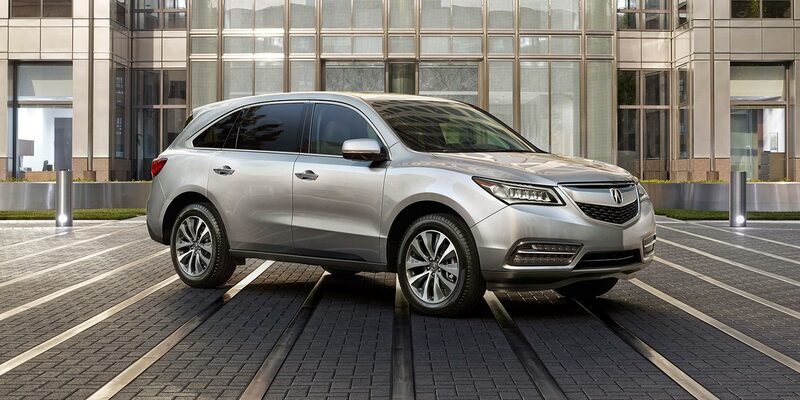 The Acura MDX offers impressive power – it is propelled by a 3.5-liter V6, 290-horsepower engine. Transmission is six-speed automatic, and while all-wheel drive is not standard, but it’s offered as an option. 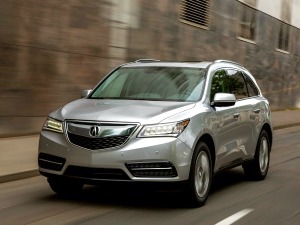 The MDX can accelerate from zero to 60 in 6.5 seconds as well. While this may sound slow compared to some sports cars, the time is actually slightly faster than that of other vehicles in its class. Fuel economy is impressive for a vehicle of this size – front wheel drive combined city/highway mpg is 23 mpg, while the all wheel drive options offers a 21 mpg combined fuel economy. Though it may not look like a hauling vehicle, the MDX can tow up to 5,000 pounds. In today’s world of increased traffic and increasingly distracted drivers, safety features are a must. The MDX has no shortage. The vehicle comes standard with antilock brakes, many airbags, rear view cameras, and a stabilizing feature for towing comes with all wheel drive models. The enhanced models offer numerous optional safety features, like collision warnings and other alerts that can help anticipate and prevent a crash from happening. One of these optional features is the innovative lane-keeping feature, which assists steering to help keep the vehicle in the driver’s chosen lane. The MDX has earned a five-star out of five rating for safety in government crash tests. In tests conducted by the Insurance Institute for Highway Safety, the vehicle earned ratings of “good,” while the collision mitigation system (which involves automatic braking to avoid crashes) earned an “advanced” rating. Driver comfort often improves the safety of drivers and passengers, and the manufacturers of the MDX realized this. The car offers easy-to-read gauges and a spacious cabin that reduces driver stress and maximizes safety. The navigation system uses an intuitive touchscreen to help drivers find their way with minimal distractions and difficulties. It also has a voice-recognition system, so drivers in difficult conditions can navigate without taking a hand from the wheel. In some cases, though, the touchscreen requires multiple buttons pressed for a simple feature, and this can be problematic for drivers operating in conditions that are otehr than pristine. The car offers good leg room for passengers, though cargo space is limited compare to that of similar vehicles. The second and third rows fold down for easy storage, though, so a car carrying two people would have a substantially larger cargo space. For many, a drive in the MDX is pleasing, relaxing, and uneventful. The handling is smooth and provides an enjoyable driving experience. Wind and road noise are kept to a minimum. Turning is especially memorable, as the vehicle hugs turns like a sports car while maintaining the secure feel of a larger vehicle. Downshifting is quick, and the MDX proves to have good traction in both the front-wheel and all-wheel drive scenarios. 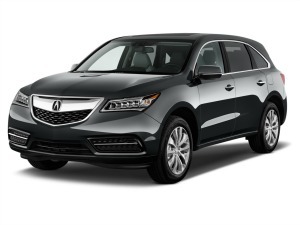 For those who are seeking a vehicle with impressive seating and cargo capacity, a spacious and logically-designed interior, and other features of many luxury cars at a surprisingly low cost, the Acura MDX may be worth a look. Buyers can limit features to keep price low or add all expansion packages to gain a luxury vehicle at a much lower price. Though the 2015 MDX ranges in price from the low to high $40,000s, buyers tend to get much more than they pay for in terms of comfort, extras, safety, and luxury.